On Saturday we will not be able to help with quilt planning or calculations (including backings). However, we would be happy to help you in advance tomorrow or Friday and encourage you to scout us out on these days. 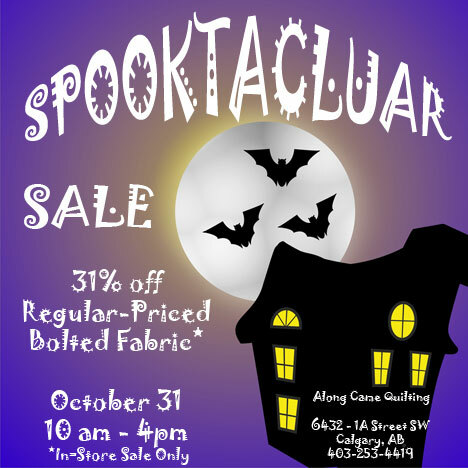 The sale does not apply to any orders or pre-orders on any fabric. Star Wars™ fabric will not be on sale and will be removed from the floor. There is a minimum 1/2 meter cut for this discount. Cuts under 1/2 meter will be at regular price. Sale is in-store, personal shopping only – no mailorders. No batting or fat quarters will be cut on this day unless there are no line-ups. Wear your best costume, comfortable broom, and a light purse. We are looking forward to not recognizing you on Saturday (costumes are not mandatory, but are fun!). PS – It’s not fun to keep them in the dark – share this with your coven and brethren. Now Prancer – Dazzle us All! With such a lovely fall, it is hard to imagine that the winter season is any day now. But we have been busy working on our holiday projects, and the new Dazzle kit is finished. 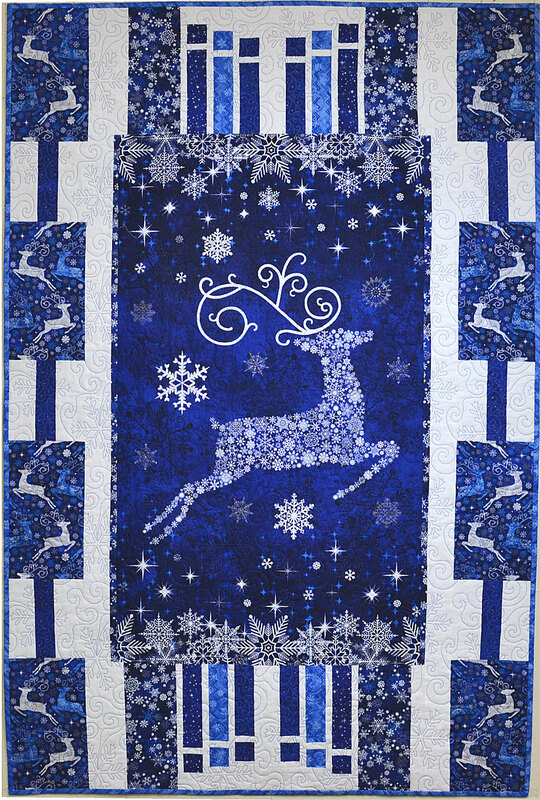 Quilt finishes approximately 44 1/2″ X 60 1/2″. There are 3 border options for this quilt. We have kitted for the largest option. However, on our sample, we proved that mistakes happen, and created a 4th border option (without the white side borders). Below you can see this kit in the red colourway with the outside side borders. The kit includes the pattern, and fabric for top and binding. Fabrics have metallic highlights – silver for the blue, gold for the red. Click here to see the blue/white quilt kit in our webstore. Click here to see the red kit in our webstore. We have some of the fabrics used in the quilt available for backings. 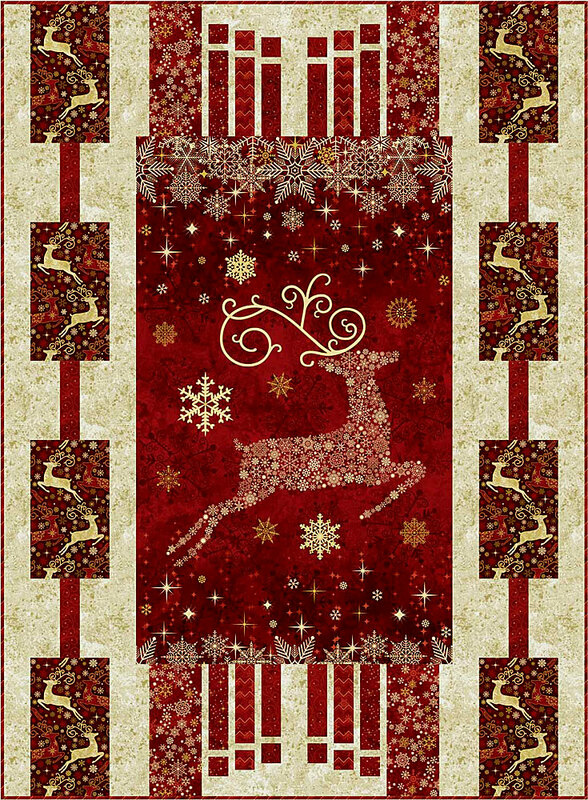 These fabrics are called Reindeer Prance and are located here (listed alphabetically). Yep, he is in the store and awaits you. Kit includes pattern and fabric for top. Binding is not included (the pattern recommends a pillow-turn method). Approximately 37″ x 54″. However, I think this would make a fabulous medallion for a bed quilt. 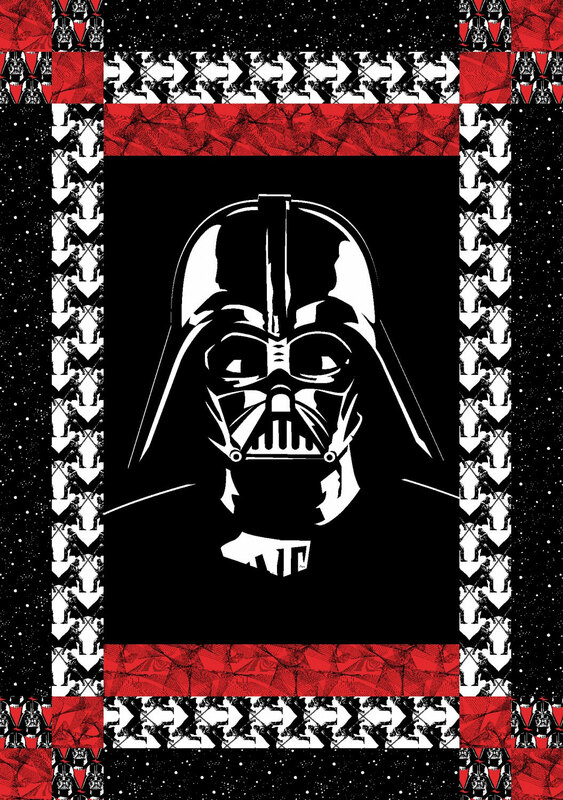 We have lots of other star wars fabrics that you could use which can be found here. Click here to see the kit on our webstore. When I was going to Glengarry Elementary school, Petra invited me after school to see her father’s entomological collection. Peering at wooden cases of dead bugs under the dim basement lights, I was slightly repulsed, but fascinated. The butterflies in all their sizes and colours, were, of course, my favorite. It’s funny how one day can have a lasting impression. The passion of a man to his hobby in the evening hours, the devotion of which I could relate to a short time later became a recurring theme throughout my life. When Edyta Sitar of Laundry Basket quilts designed the Butterflies quilt, it brought back the fascination with the colours they came in as, after all, everything I have been impassioned by was influenced by colour. Recalling the various colours, I had lots of fun pulling the fabrics to create the Butterflies kit which we now have available for sale. The sample is completed and hanging in the store. If you click on the picture, it will take you to the link on our webstore for this kit, and a larger picture. It’s for the collector in some of us. 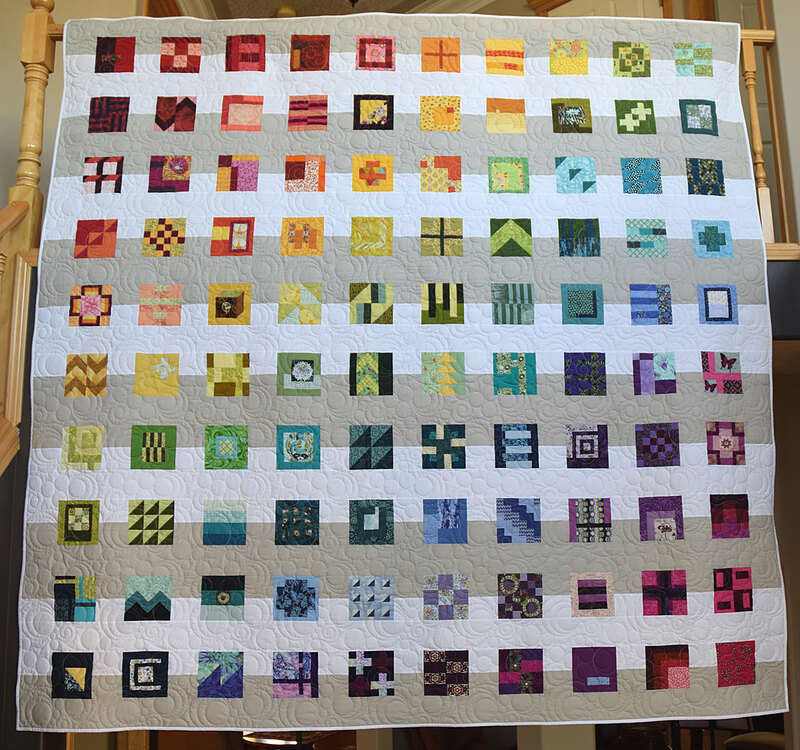 Jan used two different settings for her quilt (page 245 for the rainbow layout of the blocks and page 246 for the City Planner setting). Jane Goddard did the quilting using a wool batting and the Circle Play 2 quilting design. The loft of the wool batting made the circles “pop”. 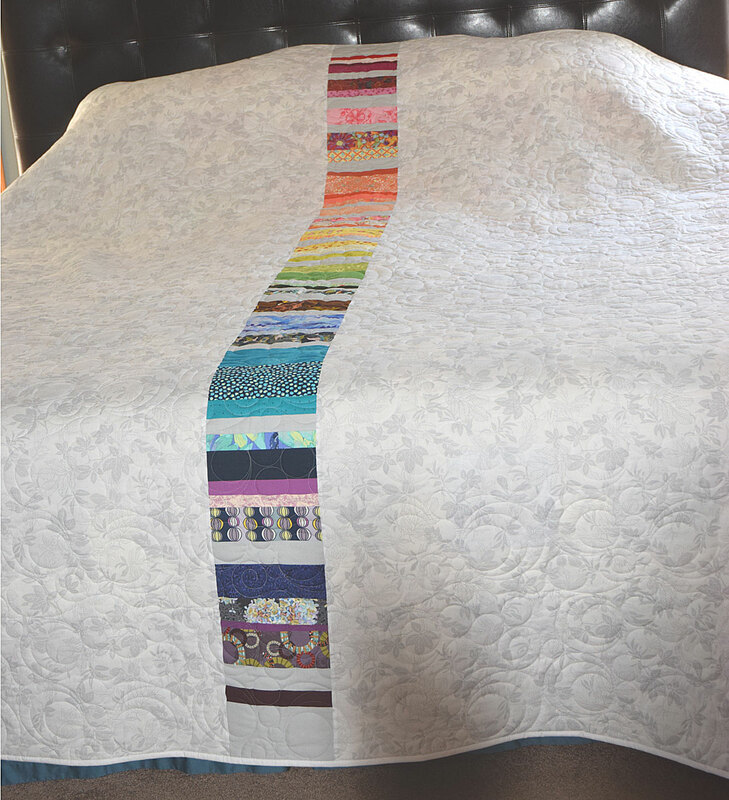 On the back of her quilt, Jan used up her leftover scraps to make a fun stripe down the back. 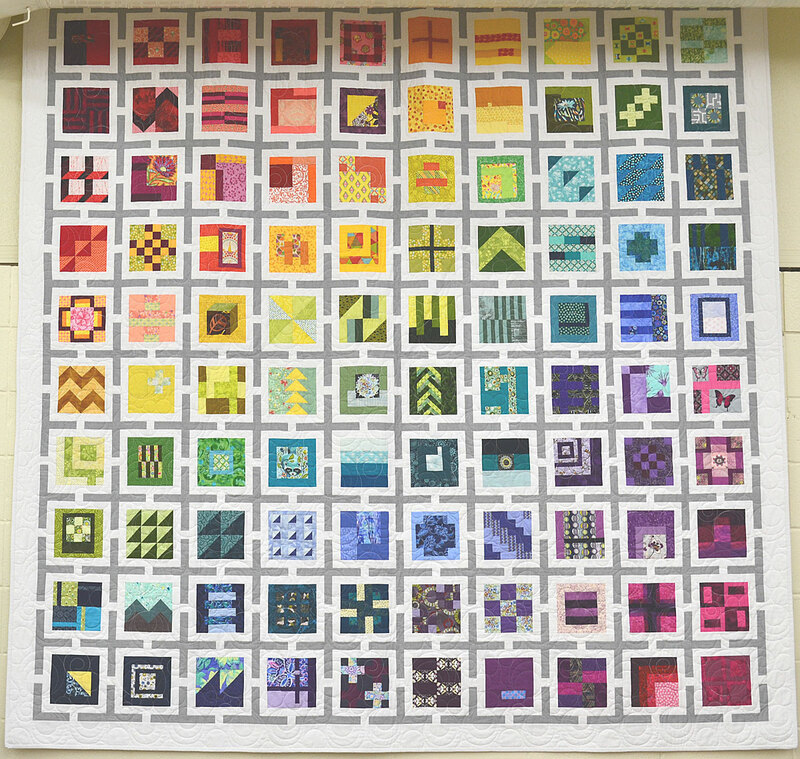 The finished size is 104″ square. This BOM has been very popular in our store, and we are now taking registrations for another round beginning in January 2016. Below are the details if you are interested. 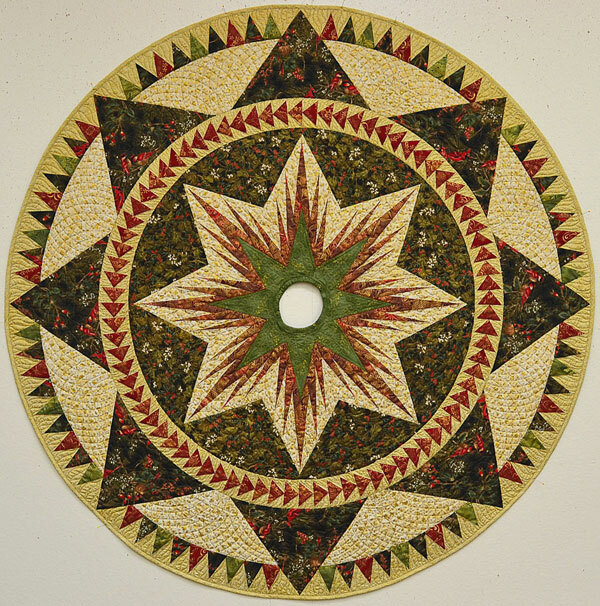 By the end of the 10 months, you will have 100 different 6″ (6.5″ unfinished) pieced – no applique – blocks which you can sew into any setting you would like. The book features five different settings, of which not all use the 100 blocks. However, you can always enlarge the smaller quilt settings to use all of them (which is what Kate did as seen in the quilt above). Thanks again to Kate and Jan for sharing their quilts with us.